Two Ray Magic Gyptone® BIG™ Quattro 41 acoustical radiant panels are installed on the wall next to the entrance door of the meeting room at Clarum Homes. The two acoustical radiant panels have multiple functions: decorative, noise reduction, space conditioning (radiant cooling and heating) and also reduce the exposure to formaldehyde. In fact, Ray Magic acoustical radiant panels are made of gypsum boards with AirRenew® technology to offer a healthier living and working environment by improving indoor air quality. It really is an ideal solution for healthier and more productive business meeting. In the infrared pictures on the side, the acoustical radiant panels are in cooling mode (purple color) with surface temperature at about 57F (radiant cooling). Gyptone® BIG™ Quattro 41 is comprised of eight even-sized sections of precisely etched 12mm square perforations. Messana Ray Magic features Gyptone® acoustical panels. Gyptone® BIG™ panels are laminated over the Ray Magic radiant substrate (1 1/2″ EPS substrate with aluminum transfer plate and radiant piping) and becomes Ray Magic Gyptone acoustic radiant panels. Dimension of the acoustical radiant panels are in european standard: 1200mm x 2400mm (very close to 4’x8′), 2″ in thickness (1 1/2″ EPS substrate + 1/2″ Gyptone acoustical panel). Ray Magic QUAD for drop ceiling commercial applications. Messana Radiant Cooling also features Gyptone® BIG™ tiles in a 24″ x 24″ format: Ray Magic QUAD. Ideal for schools, meeting rooms, offices, hospitals and airport lounges. Acoustical panels offer Class C sound absorption and an NRC of up to 0.70. All Messana acoustical radiant panels feature gypsum board manufactured by Saint-Gobain and are suitable for radiant cooling and heating applications. The Gyptone® line of acoustical ceiling panels is manufactured by Saint-Gobain. All Gyptone® tiles and boards feature AirRenew® technology. AirRenew® takes formaldehyde out of the air and converts it into safe inert compounds. Once they are captured in the board, they cannot be released back into the air. Great solution for the meeting room. How is the panel trimmed out? Can you send close up picture? The panels are simply screwed to the wall and the side of the panels is painted in white. The fittings inside the panels were insulated and the two semicircle cut off patched in. For a better result we suggest to use a drywall trim all around the panel. We will be taking some pictures soon and add them to this blog. Lovely new web post. Couple of thoughts. Seems to me that wall mounted panels are less effective the lower they go since the goal is to remove the heat which is more abundant higher up in the space. It’s important to clarify that a wall radiant panel, in cooling, has a convective thermal exchange decreasing from the top down to the bottom due to its vertical position. In fact, on the higher surface of the panel, where the convective exchange begins, the delta T with the air is greater and therefore the wall panel perform with higher efficiency. As the air goes down gets cooler and its capacity to transfer heat to the panel is reduced. The remaining part of the panel cooling capacity (55-60%) is related to radiant heat transfer. Here it’s important to say that the vertical position helps the thermal exchange with the human body. If the room isn’t too large and the people not too far (enough large angle of projection between the body and the wall; using physic terms: a good view factor), about 12-15 feet for normal high of the walls. Thanks to these dynamics the thermal sensation on the human body is very uniform and comfortable. The choose of the position of wall panels can be critical to have good thermal exchange. 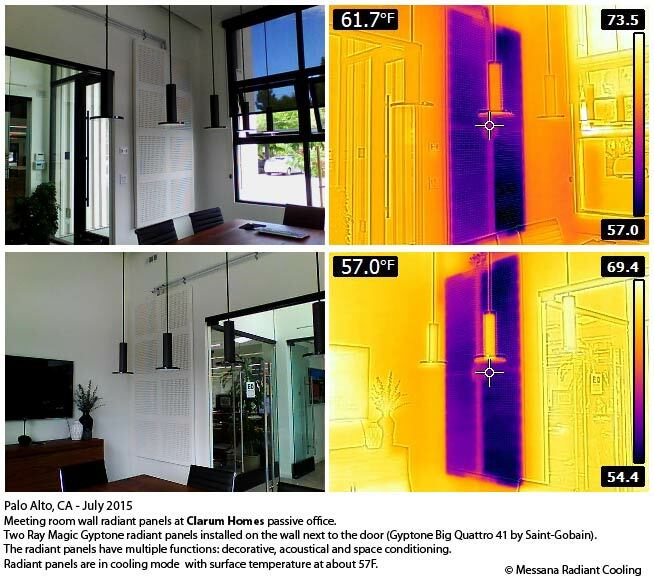 The radiant exchange is higher when wall panels “sees” hotter surfaces.. for example windows. This is one of the favorite topic of our inspiring guide Roberto Messana. And could be interesting matter for a new post. A view factor, is the proportion of the radiation which leaves surface that strikes surface . In a complex ‘scene’ there can be any number of different objects, which can be divided in turn into even more surfaces and surface segments. Far reach here, “scientifically proven” of a concept which is more a convenient verbal construct than thermodynamic reality. Radiant heating is clearly heating by infra-red radiation traveling at light speed. “Radiant cooling” is more than a misnomer. Like “immaculate conception”, there is simply no such thing in science. What we conveniently call radiant cooling is actually absorption of radiant heating rays, by a cooler surface, or the exact opposite of radiant heating. There are infra-red heating rays, but no cooling rays of any wavelength. “Radiant cooling” is a convenient verbal shortcut, a contra-scientific artifice that is much easier than trying to describe differential temperature absorbtiion of radiant energy to lower the mean radiant temperature of a space. Thank you Michael for your observation. Speaking of “radiant cooling” seems a contradiction, almost an oxymoron since the radiation will always generates from the hot surface to the cold surface. Scientifically speaking, however, calling it “cooling” is a pure convention. It would be more correct to call it “less hot”. For this reason the temperature scale used in science is Kelvin where the “zero” corresponds to absolute zero, and all values are positive. But the term “cold” is derived substantially from how we feel. In fact, we say “I’m cold!” and not “I’m less hot!” if we jump into snow with bathing suit! The sense of “thermal touch” is related to two different types of sensors that we have in the skin: Pacinian corpuscles, specialized in sensing heat, and the clubs of Krause, specialized in sensing cold. Each of them sends to our brain electrochemical impulses in different proportions and amounts depending on how much our thermal condition differs from the equilibrium condition (homeothermy). This is how human thermal feeling works. The term “radiant cooling” thus derives from our feelings and not so much from the physical phenomenon in the strict sense, but from the physiological sensation. Since radiant systems are made to serve men and not walls or ceilings, then “radiant cooling” seems a coherent expression. The physical phenomenon behind radiant cooling or radiant heating is the same: thermal radiation from hot to less hot. Your observation gave me the opportunity to clarify an important concept, thank you!